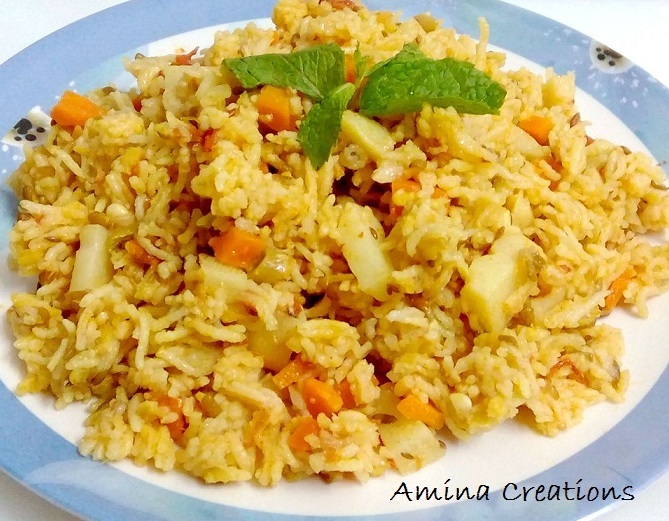 Khichdi is a healthy and delicious dish made with rice and lentils. Moong dal is commonly used while making khichdi as it adds a nice flavour and taste to it. 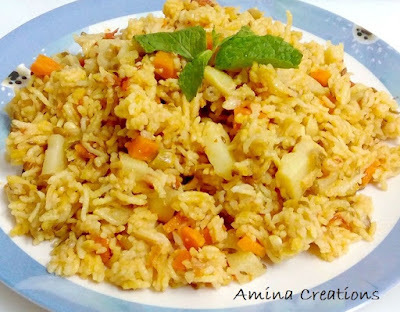 In today’s post I am sharing the recipe of masala Khichdi with vegetables which you can prepare for breakfast or lunch. This is a one pot meal and goes well with poriyals or any side dish of your choice. Wash and soak the basmati rice and moong dal in water for about half an hour. Heat oil in a pressure cooker, add cumin seeds and allow it to sputter. Add onions and saute till the onions turn soft. Add ginger garlic paste and mix well. Cook for a few seconds till the raw smell goes. Add salt, red chilli powder, garam masala powder and turmeric powder and mix well. Add the chopped tomatoes and mix well. Cook for a couple of minutes till the tomatoes turn soft. Now add the chopped vegetables and coriander and mint leaves and mix well. Drain away the water from the rice and moong dal and add them to the cooker. Stir the rice and dal well with the masalas. Pressure cook for 4 whistles and serve hot.